HP unveiled six new printers under its OfficeJet and Envy lines with easy ink cartridge replacement options. These printers ship out of the box with compatibility for HP's ink subscription service called Instant Ink, a home solution that's comparable to enterprise-class managed print services. The program is available on the HP Envy 4520 all-in-one, HP Envy 5540 all-in-one, HP OfficeJet 4650 all-in-one, HP OfficeJet 3830 all-in-one, HP OfficeJet 5741 and HP OfficeJet 5743. Instant Ink is a managed print service for home and small business owners. Essentially, you sign up for a package based on your monthly printing needs, and just before you run out of ink, HP will have new cartridges ready for you in the mail. The program can save customers up to 50% on printing costs, according to HP inkologist Thom Brown. Brown, whose job is to design the best performing inks for HP's printers, says the program gives HP a way to deliver more affordable printing costs to customers. In the past, customers may turn to cheaper refill solutions that use unauthorized ink, which could lead to poor print quality and degrade the print nozzles. Now, with Instant Ink's savings, Brown hopes that HP will find the service as an affordable alternative to these un-sanctioned third-party refill solutions. Instant Ink starts at just $2.99 per month for up to 50 pages. The average home user prints just 43 pages per month, so the cheapest plan is good for most people. It doesn't matter if you're printing full-sized photos or just text on these pages, Brown said. If you go above your quota, you can purchase additional pages, or you can up your plan to a higher package. If you go under your quota, you can rollover your unused pages. The rollover pages don't expire, unlike rollover data on some mobile carriers, but there is a cap where pages stop rolling over if you're not using your package. Instant Ink doesn't come with contract, and you can start and stop the service at any time. Brown boasted that the Instant Ink program has one of the fastest adoption rates among subscription services like Netflix, Hulu, and Dollar Shave Club. Because Instant Ink requires communications with HP's servers to communicate how many pages you consume, you'll need an internet-connected printer. HP says that the six new printers make a total of 17 Instant Ink-ready printers. 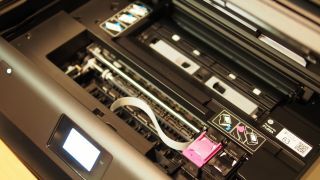 HP is also changing the program from Instant Ink-capable to Instant Ink-ready. In the past, you'll purchase a capable printer, then you'll buy an Instant Ink kit and then your experience starts when you receive your Instant Ink welcome package with Instant Ink-specific cartridges. Now, HP is shipping Instant Ink cartridges in the printer so you don't need a separate package or welcome kit. When you're setting up your printer, you can choose to opt into the program, or replace and purchase future ink cartridges yourself. When asked if Instant Ink cartridges are different than the old, normal cartridges that shipped with HP's "capable" printers, Brown told techradar that the cartridges are no different. HP just redesigned the servers and the way they communicate with the printer, which makes it unclear why you'll need special Instant Ink cartridges. The program sounds like it is great for college students, scrapbookers and those with a regular print schedule. As part of the Instant Ink program, HP is also making its printers more easy to manage for small business users. Select office printers come with a one- or two-year subscription to Instant Ink included in the price of the printer. The HP OfficeJet 5743 and OfficeJet 5741 are all-in-one printers with wireless printing, fax and copy features. The 5743 comes with one year of Instant Ink, while the 5741 comes with two years of ink service. The HP OfficeJet 4650, which HP demoed at an office in San Francisco, comes with an auto-deploy paper tray. When you start your printing, the paper output arm swings out to catch your printed sheets. When you retrieve your prints, you can close the arm again to save space. HP is printing easy mobile printing from tablets and phones on the OfficeJet 3830 along with easy mobile setup from a smartphone. For home users, the HP Envy 4520 and 5540 are sleek printers. The 5520 has a dedicated tray for specialty photo papers, and the printer can intelligently determine to print from the standard paper tray or the specialty paper tray depending on the print job, said Brown. Brown said that HP's printing technology from its LaserJet and InkJet printers will make it into its 3D printers as well. HP is leveraging its PageWide technology to combine multiple print nozzles to cover a larger surface area to expedite 3D printing. It's using the heat technology in laser printing to melt plastic in a technology called MultiJet 3D Fusion. This will make plastics stronger.